February welcomes both Spay/Neuter Awareness Month and World Spay Day. 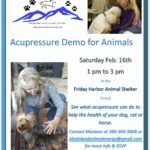 To celebrate The Animal Protection Society of Friday Harbor will host two annual events to educate on the importance of altering and to encourage pet parents to have their pets sterilized. 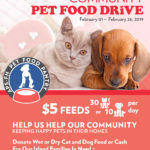 The first, Pet Pantry Community Pet Food Drive February 1stthrough 26thand on Tuesday, February 26that the Mullis Senior Center, the 12thAnnual ‘Spay-Ghetti’ Dinner. 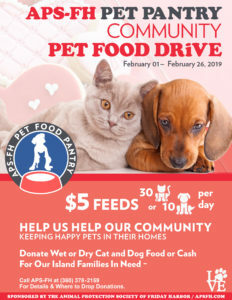 Through February 26thAPS-FH invites shelter friends, family and supporters to help keep happy pets in their island homes by donating wet or dry cat and dog food, cash or checks. For pet food donations, look for one of several collection bins and for cash or check donations please contact Leslie Byron, Director APS-FH, at 360.378.2159. All Pet Pantry community pet food drive donations will be distributed to island pet families in need. 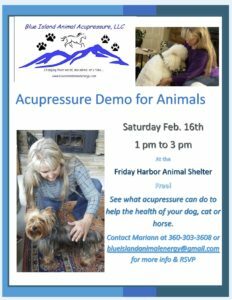 Collection bin site locations include, APS-FH, Treasure Hounds (next to Cousin Vinnie’s NY Pizza Cafe), Islanders Bank, Key Bank, Islands Veterinary Clinic, Friday Harbor Market Place and Friday Harbor Pet Supply. 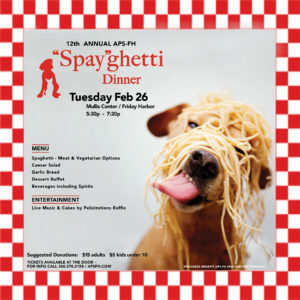 Businesses and/or groups are encouraged to collect as a pack with a Most-Collected Winner announced at the ‘Spay-Ghetti’ Dinner. To schedule a pack pickup please contact Kalvin Galligan at 360.298.1330. 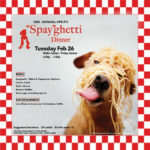 The 12thAnnual ‘Spay-Ghetti’ Dinner will be held this year at the Mullis Senior Center on Tuesday February 26thfrom 5:30pm to 7:30pm, rain, snow or shine. Offerings include both meat and vegetarian spaghetti, garlic bread, Caesar Salad, dessert buffet, spirited and non-spirited beverages, music and a raffle for a wonderful work from Cakes by Felicitations. “Our findings show that the number of dogs and cats being killed in the U.S. each day has dropped from more than 9,000 per day to 5,500 per day (or two million per year) over the last six years. Gregory Castle, CEO Emeritus, Best Friends Animal Society.